If you have a strong light source (in this case the sun) in your back, and you are looking into clouds or fog then you can see your shadow surrounded by a glory. This phenomenon is also called the "Specter of the Brocken". Everybody can see the shadow of himself and people nearby - but only one glory around his own head - the antisolar point. The glory is formed due to the favored back-scattering of light by the small waterdrops. The radius of the glory is dependent on the size of the drops - the smaller the drops, the bigger the glory. 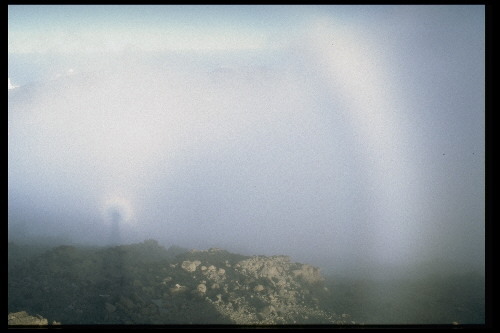 If the mist has a distance of more than about 50 m you also can see the more extended fogbow. It is similar to a rainbow, but without any colour.